This pod consists of both a wired and wireless network platform supporting dual ISP links. It can scale both its ISP links and access edges easily and without forklift upgrades. The focus is on fair-share and user experience as it relates to a BYOD(Bring Your Own Device) coworking environment. The components should provide the ability to calculate an in-path service uptime SLA(Service Level Agreement) where and when possible. All edge ports shall support PoE+ 802.3at (as opposed to basic PoE 802.3af) for full 802.11ac support and device future-proofing. Note: All 48 gigabit ports of the listed switch supply PoE+ and there are an additional 4 ports which are SFP/SFP+ (which support 1 Gbps or 10 Gbps for a range of further options). All access edge devices are cloud managed for simplicity, reduced controller footprint, and ease of lifecycle management. R001 40-500 users In 2014 we see about 1 to 4 IP addresses/devices per user (but on average about 1 to 2 IPs) thus we are building for organisations with a minimum of 40 user devices and a maximum of 2000 . Depending upon the core layer 3 device a pod can easily scale the number of edge access points but one must take in to account the concurrent connection limit and capabilities. An initial 300 shall be our notional upper bound for this design (based upon 3 access points only) though it in no way precludes the configuration being used for either smaller or larger environments. R002 Support for dual redundant ISP links/connectivity No ISP has 100% uptime thus dual ISP links help to increase network uptime/reachability. Active/active is the preferred configuration for ISP links to maximise return on investment. Caluculations should be performed to understand the potential impact of any single point of failure in a network design. R003 The user access edge shall scale organically and easily. To add more users and capacity it should be a case of either plugging in more wireless access points, more switches, or just ordering faster ISP links. So called ‘fork-lift’ upgrades of core equipment should not be necessary within any 3 to 5 year cycle once the core is right-sized from the outset. R004 No individual shall be able to monopolise the bandwidth. A fair share policy must be in place such that one ‘hungry’ or unwitting user or device can not adversely impact other users productivity and access. This is the fair-share policy enforcement capability. R005 99.99% uptime/availability The goal is an integral service 24/7 but with 4x 9's availability there is 52.56 minutes downtime allowed per year (excluding planned maintenance and even then maintenance should minimise any and all service impact). The aim is to get to a MTBF-> ∞ and a MTTR->0 whilst also ensuring that data and services are always integral and assured. R006 All devices and paths shall be used efficiently. Effective load balancing and active-active paths should be used where and when possible including across n+1 tiers if applicable. Capacity management and reporting should be automated and easily scheduled. Basic instrumentation and dashboards should be easily understood and available to non-technical users/entities. R007 PoE+(Power over Ethernet) 802.3at shall be provided. All edge switching will provide/support PoE+(plus) for devices (i.e. 802.3at and not just 802.3af) specifically for 802.11ac access points and device futureproofing. Additionally this has the benefit of powering all devices and WiFi access points if a pod is supplied with clean/protected power from a UPS(Uninterruptible Power Supply). Furthermore conditioned power and resilience to power outages protects an organisations investment while ensuring maximal uptime for said devices and services. R008 Power will be conditioned and provided by a UPS This not only extends the lifetime of the equipment investment but ensures maximal uptime even during brief ‘brown outs’ or over-voltage conditions. A remotely instrumented UPS also allows an organisation to help quantify its I.T. power spend and refine its operating expenditure (as all devices run on the UPS as per R007 above. R009 Dual gigabit PoE+ to access points All 802.11ac access points shall have dual gigabit cabling run to them. This is to support full throughput in the form of 2 gigabit aggregated links for future 160MHz channel bonding of 802.11ac and also to allow maximum data transfer locally between high throughput 802.11ac clients. Additionally this provides data path and power redundancy to access points in the case of a path failure or interface failure. R010 Ability to shape wired users by group and individual policies Irrespective of queuing strategies there must be the capability to control wired users and ensure they can not displace wireless users or the overall ‘fair share’ policies. This must be easily implemented on a per SRC IP and per FW policy basis. 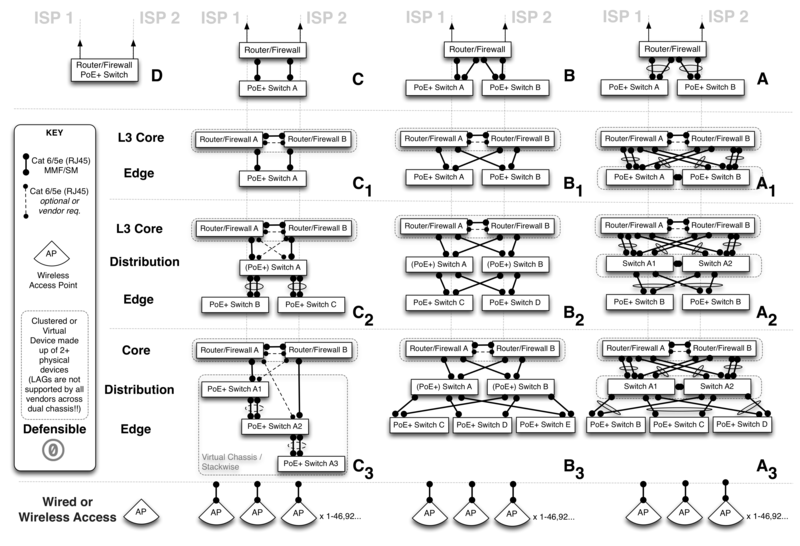 The following patterns constitute a high level view of some common network pods. Depending upon the budget, desired functionality (and vendor choice or availability), these patterns seek to provide a starting point to help facilitate discussion and the subsequent making of decisions with regards to the level of redundancy and fault tolerance required by the organisation. Small organisations with 20-150+ users with a higher tolerance for potential downtime (outages in and unavailability of network services) could happily use patterns D, C, B or A (including single or dual wireless access points), however small to medium sized organisations with a low tolerance for downtime (not more than a few minutes per year) would do well to begin with patterns B₁ or A₁ and a minimum of dual wireless access points. MTBF (Mean Time Between Failure) for a component or device, this is the predicted elapsed time between inherent failures of a system during operation. Many vendors of consumer level goods do not calculate nor test for this value yet once you purchase a certain grade of equipment the manufacturers should be able to provide this value e.g. a Juniper SRX 220’s MTBF is 13.46 years and a Juniper SRX220H-POE’s MTBF is 11.06 years. MTTR (Mean Time To Repair) is a basic measure of the maintainability of repairable items. How long would it take to get a fully functioning replacement installed or repair completed such that the whole system is again performing as it was before the failure. Some refer to a Mean Time To Recovery however it is in this context and spirit that we speak of ‘repair’ i.e. from the moment the device or system impaired in some way to the moment it is fully functional and in production once more (as it was previously). Availability where we are talking about a system being available in terms of time. Some may argue that ‘available’ does not equal accessible and they may be right, but we advocate calculating the base level Availability of hardware in any system so one knows what SLA(Service Level Agreement) can actually be offered to users (or how to align an equipment spend to better or match another service providers SLA’s). Once one calculates the Availability for a device one can then increase that Availability of the overall pod design by introducing additional redundant paths and devices which ensures network reachability to an application or remote online service. It has to be said though that one thing that can’t ever really be accounted for is human operator error, change management, or undiscovered software bugs - so for the moment we shall ignore them in terms of their potential affect on a pod’s Availability and focus on the actual known hardware provided metrics. So the lesson here is that components and devices will and do fail, and when they do, it is good engineering practice (if you have the budget and expertise) to have at least 2 devices with dusl redundant paths rather than just a single path and 1 device performing a certain role. We can repeat this exercise for each tier of the network (where there are calculations also for devices in serial Availability = Aₓ(A𝑦) rather than in parallel Availability=1-(1-Aₓ)²) however this is beyond the scope of this ‘cheat sheet’ and suffice it to say that your organisation will be in a better place with what we call N+1 devices at each tier (i.e. an addition of an extra n devices to get a minimum of 1+1=2) rather than just a single device at each layer. Hopefully this small piece of maths will cause you to look more critically at the previous pod layout diagrams once more. Note: The design pattern of the Pod C allows for only a single serial pathway to Internet services and Fortinet do not readily publish their MTBF values. We advocate a simple security model of trusted, untrusted, and semi-trusted zoning. Examples of which might be that users and guests are semi-trusted, security devices and agents are trusted, and the Internet is deemed untrusted. There are also concepts of control and manageability in the sense that devices, software, or employees might be deemed controlled or uncontrolled, and managed or unmanaged. This classification system means that when one thinks about an uncontrolled application/user on an unmanaged device coming from an untrusted zone, one doesn’t really want them able to directly reach controlled and managed security devices (which reside in the trusted zone). This is one reason partitions are created so that policies can be applied to traffic at network boundaries when it is moving from one zone of trust to another. When quickly trying to identifying the risk classification of an asset, computer, device, or person; the below grid may help to quickly figure out where they should reside. Note: For a more in-depth but still easily understood security framework, we recommend reviewing the Secure Arc Reference Architecture. When naming any assets it is desirable to be consistent and have the concept of a namespace from which to build hierarchies and relationshoips between entities i.e. components, services, and agents. It is highly recommended to encode some idea of the device function and location in to its name (however this is not actually necessary and some may argue that this is what SNMP(Simple Network Management Protocol) system and location details are for). Doing this has however proven very useful in distinguishing devices, automating, and performing management tasks. Following a naming convention (including that of adding the device in to the DNS namespace (and/or an organisation’s asset management tool) helps to identify, manage, and enumerate all things more clearly! For larger organisations worries about information leakage and reconaissance, split DNS is recommended. (More on naming: https://tools.ietf.org/html/rfc1034#section-3.1). Every name should be configured and written in lower case and one should always avoid lower case ‘L’s and upper case ‘i’s. Dashes should be used to separate names in to easily recognised variables, and dots should separate zones, groups, and tiers which are then compatible with DNS. There are many approaches to this so the above is just to be considered a helpful hint and only one way of many to organise ones namespace. Equally one could create multiple sub classifications however it can become unruly to manage if there are too many child sub-domains or zones. This should be configured as the pattern for the hostname on each device. IP Address design is one of the fundamental building blocks which can even dictate the physical connectivity based upon the security or capacity requirements. Good IP address design and management is foundational and can make things much easier down the road when applying organisational or technical policies to application traffic flows, tenancies, users, or subsets of devices. A simple IP address model for the aforementioned network pods is based upon /21 CIDR subnets and allows for user, guest, voice, security, and management blocks including additional sub-divisions for things like sub-tenancies or other unexpected uses. A good rule is to always add on about 30-50% to the number of IP addresses or subnets you think you need currently -> to save yourself much pain later! We recommend using the lowest IP address of each subnet as the default gateway e.g. 10.0.64.1 in 10.0.64.0/22 and 10.0.74.129 in 10.0.74.128/26. We also recommend keeping the first 50 IP’s in larger subnets (and the first 10 in smaller ones) for assigning static IPs from and also for certain infrastructure purposes, including but not limited to, HSRP, VRRP, GBLP, VRF’s etc. If each pod constitutes a physical site such as a building or small campus then (depending upon the number of devices/users per floor), the design tends towards a main /22 user subnet at the beginning of the block. The following is an example of the third such site with other pods using 10.0.16/20, 10.0.32/20, 10.0.48/20 and then the 5th site is 10.0.64/20. VLANs are Virtual Local Area Networks used to partition and minimise layer 2 broadcast domains. They can also provide some extra separation at layer 2 from a security context (though not infallible). Many people still get confused between VLANs and subnets however they should not be confused and they are not simply interchangeable as terms. It is however always nice to have VLAN IDs match the third octet of your subnet (however this is not always possible and definitely not necessary). Even with extended VLAN ranges you may not be able to initially match your VLAN IDs to subnets nor may not care (as VLANs are their own identifiers and not bound in any way to the layer 3 subnets). However for small customer networks (i.e. not large enterprise, ISP, or data center networks) it can be easy to match VLANs to subnets if one isn’t worried about wasting or breaking continuous VLAN ranges. We present such a schema below that matches the above subnet ranges. Please check with your vendor documentation which VLANs are configurable or reserved for special purposes on your platform. Depending upon how many sites one has, your desire for unique IDs, and any future plans to bridge layer 2 domains (which we recommend against) one may find the below schema usable and easily repeatable for up to 4080 sites/pods (with unique RFC1918 10/8 addressing though it is quite wasteful of the higher VLAN ranges, there are still thousands to cherry pick from and as this is not a Secure Multi-Tenant IaaS or cloud design we can afford to focus on aesthetics and not pure scalability!). Note: Please remember that as long as you are not layer 2 bridging sites and pods you can happily re-use VLAN IDs in each site, thus there is no issue with having VLAN 20 or VLAN 64 in two separate sites. This is for a site that begins with populations in the VLAN 32 ID i.e. the 10.0.32/20 subnet range when maintaining a handy VLAN to subnet mapping. VLAN IDs 1-15 are reserved in all sites for special uses. 4-15 n/a Reserved and not used. All infrastructure and access cabling should be gigabit and any trunks (where possible) should form 2 Gbps LAG(Link Aggregation). Note: At the time of writing 1 Gbps is still sufficient even to 802.11ac wireless access points however if the opportunity arises to run dual cabling to access points it should be taken, as much for path redundancy as for future proofing the throughput. Cabling is always cheaper and easier to do properly and fully the first time. It is highly desirable to connect low number port IDs to low number port IDs, and ascend connection pairs together towards higher sequential numbering. For example when you connect a port from one switch to another switch you should always try and connect port 1 on switch A to port 1 on switch B (if possible) and then ascend (or descend if relevant) in sequence and with symmetry. When connecting switch ports to patch panel ports it’s also considered good practice to connect the lowest ports on the switch in sequence to the lowest (available) numbered ports on a patch panel also (even match their least significant alpha/numeric digits if you can to make patterns simpler!) and the same thing applies of course for higher ports to higher ports. Essentially symmetry and sequentiality is desired with all connections both logical and physical where and when possible. If cabling is not going directly from device A to device B then it may well go through some fixed or structured cabling to get to a remote device endpoint. Note II: Where the patch can be a ToR(Top of Rack) copper or fibre patch panel. Sometimes you will hear the terms IDF(Intermediate Distribution Frame) or MDF(Main Distribution Frame) in relation to the infrastructure cabling. If you are using fibre you may hear the terms ODF(Optical Distribution Frame) or FOBOT(Fibre Optic Break Out Tray). Access points should be placed according to a full initial site-survey combined with explicit business and application requirements. At a minimum a predictive modelling design (based upon the requirements, floorplans, and material characteristics should be inputted) coupled with a post validation survey (which must be performed). If using only LOS(Line of Sight) combined with the avoidance of any obvious electromagnetic interference sources or absorbent materials one maybe able to narrow down the best locations for mounting access points however this is no substitute for either of the first two options above and would be considered a last resort which should be accompanied by continuous improvement efforts. Always consult the vendor documentation and best current practices to avoid serious performance, quality, and security issues including a greatly increased Total Cost of Ownership or serious reputational damage during the lifetime of the service. High density principles must also be used in spaces that double as temporary event spaces. Particular attention must be paid to spectrum reuse, co-channel interference/contention, choice of antennas, and interference sources. Use as many discrete and clear channels as possible in a space to form micro-cells. The nature of any unlicensed radiospace can change dramatically due to many environmental factors including but not limited to neighbouring tenancies and portable broadcast devices; the RF(Radio Frequency) spectrum should be sampled and surveyed regularly via the installed infrastructure or via additional surveying. It is generally also better to use static channels rather than leave them on auto (as not many vendors Auto-RF works very well) unless a policy can be implemented within the platform to determine under what explicit conditions the channels automatically change to and when. More often than not you can cooperate with your neighbours to work around static channels as if all parties use auto then there is almost no predictability and increased disruption. For fundamental data connectivity, the RF(Radio Frequency) desirables are a minimum -67 dBm RSSI with a minimum 25 dB SNR, and 3-6 metres of overlap between AP cells if roaming. NoteI: In smaller spaces the channel widths can potentially be increased to take advantage of 40MHz, 80MHz and soon to be 160MHz wide carriers (making use of channel bonding) however it is always preferable to find clean air and to scale extra access points in to available spectrum by virtue of micro cells for increased capacity and lower co-channel contention. For high density deployments 20MHz channel widths are preferred for both coverage and channel availability, however this can also increase airtime if heavy utilisation is expected (your mileage may vary!). One has to balance ‘clean air’ and capacity, all the while designing for the best SINR(Signal to Interference Plus Noise) ratio possible. There should only be a maximum of 3-5 SSID’s per access point (and/or radio) depending upon frequency and channel due to overheads from beaconing. Albeit some vendors say that up to 16 or 64 SSIDs can be configured, it would in fact bring the radiospace to a crawl. For optimal operation and association the SSID’s should be split by dedicated frequency range (which also aids troubleshooting end points and onboarding to 5GHz when supported). If possible to (and dependent upon the client devices expecting connectivity) disable all speeds and MCS indices below certain rates. For 2.4GHz you can disable everything below 12Mbps to disable 802.11b rates. For 5GHz you should maintain 6, 12, and 24Mbps as basic and mandatory unless you have design reasons to use 18Mbps or 24Mbps as the lowest but please be warned this may affect roaming and SSID discovery based upon client devices types, algorithms, and sensitivies. 802.11g/n 2.4 GHz 20/40 Mhz 20 Mhz 1,6,11 Ensures no channel bleed/co-channel interference from managed devices until > 3 access points then re-use should separate channels based upon distance, power, and environmental factors. 108, 112, 132, 136, 140) Lower channels with wider wavelenghts should be used first for access points to ensure greater penetration(if available). 108, 112, 132, 136, 140) DFS channels should be used first as 802.11ac is still relatively new and the focus should still be on the larger population and experience of the 802.11n users/devices micro-cells. 802.11ac’s higher speeds are only really beneficial in certain spaces for 802.11ac to 802.11ac client flows as generally the ISP Internet circuit is the bottleneck and not necessarily the LAN. 802.11ac should be considered only a localised enhancement in spaces where 802.11n’s practical throughput still exceeds that of the Internet pipe. Should local speeds via wireless require the full capabilities of 802.11ac then the 80 Mhz channels with explicit beamforming and 256-QAM really come in to full effect. Note II: Radio power should generally be kept low per radio (10dBm-14dBm depending upon coverage desired and client base) and work from more powerful to less powerful with regard to newer transmission types i.e. 802.11ac(5GHz) -> 802.11n(5GHz) -> 802.11n/g(2.4GHz) which encourages most device drivers to prefer stronger, faster, and cleaner signals where and when possible. This discourages devices to connect to 2.4GHz even with dedicated SSIDs and ‘band steering’ enabled albeit 2.4GHz signals tend to always look stronger, they are in fact generally polluted and subject to heavy co-channel interference/contention in most environments. 2.4GHz signal strength per radio should, as a rule of thumb, be 6dB less than the 5GHz radio on the same AP. But by no means is set in stone. Please use an initial “AP-on-a-stick” to get real RF propagation values or at the minimum do the most accurate predictive survey you can. Note III: One of the main issues encountered (apart from co-channel interference/contention) can be with whats called ‘hidden node’ regarding stations/devices that can not hear one another but can hear the access point. Ensure that all clients in a local co-channel domain can hear one another. Also, take in to consideration vertical as well as horizontal floors in a building when stacking APs vertically such that cells only overlap where designed for and not accidentally if you are designing a wireless service across floors. For any dual ISP configuration it is desirable to have totally separate ISP providers (and if possible, totally diverse paths to network equipment including that of the building POP(Point of Presence) and risers - however this is rarely feasible for many reasons). Apart from the fact that using the same ISP for both links would represent the same administrative and governance failure domain and in most cases the same reachbility failure domain; it does not facilitate competitive leverage on pricing and constitutes a form of serious vendor lock in. One may however use the same ISP for each of the main links at multiple discrete sites which can actually reduce the number of inter-site hops and decrease latency for thigns like inter-site video conferencing and VoIP. Depending upon ones country or territory, ISP links and plans can vary widely in terms of costs and features, yet what is optimal is a fibre link with unlimited Internet data (also ‘on-net’ data which is a given), and a basic QoS(Quality of Service) offering such that you can colour traffic and have it handled differently by the ISP. Unlimited data allowances greatly reduce the need for extremely difficult and expensive elements of capacity management normally experienced by those who sign up to ISP plans with explicit data caps (typically in the hope of saving costs which actually then backfires!). Also, fibre is not subject to the same weaknesses and interference that copper services are and has a much better upgrade path whereby the ISP in most cases can just dial up the service rate with a few simple remote commands. Symmetric services are also preferred over asymmetric services as contention for uploads is one of the greatest threats to network access quality. Asymmetric services also make configuration for QoS more difficult to configure, more costly, and less easy to troubleshoot. The future seems set to see content generation and upload demands increase rapidly so ensure that symmetric services are provisioned. Contention is an oft unspoken variable in ISP services which can bring a service to its knees. Ensure that a 1:1 contented Internet service is chosen such that your organisation is not at the behest of the traffic patterns of other ISP customers. The following figures are rough guides and depend wholly upon the type and style of usage in the space. We have found that the most conservative requirements for users on the layer 3 device are 3 / 3 Mbps per device (which still enables SD/HD video streaming and 1:1 HD video conferencing). A typical device speed setting can be calculated with a fan-in ratio of 6:1 i.e. for every 1 Mbps of ISP connectivity, every device can achieve a maximum of 1/6 of it. For device populations of 40-300 it is recommended to allocate the maximum throughput per device @ 1/6 of the maximum achievable single Internet network flow (i.e. a true single TCP flow on a link). This fan-in ration works well when fairly shaping devices and endpoints (not on the access edge but on the core or towards the Internet WAN interface). Unfortunately the nature of ones actual traffic streams can only really be inferred over time by using somthing like application visibility or DPI(Deep Packet Inspection) methods to determine what traffic is deemed critical/valid and what is deemed to be superfluous or invalid traffic. The nature of most endpoints whether wired or wireless is that they can and oftentimes do generate excessive amounts of connections or throughput which may overwhelm the local ISP link if left unchecked. The ugly truth is that irrespective of queuing methodologies, a saturated buffer is a saturated buffer, and a full pipe is a full pipe. A single linux device running hping or zmap can cripple many an infrastructure device (as can a lean statically mapped torrent client in a 100,000 user swarm). It may not be a popular position but shaping endpoints to ensure policy enforced maximum allowable speeds are unable to overwhelm an Internet link is just good defensive practice. Of course one can give certain endpoints priority or even guaranteed throughput above all others, however the more complex the policies enforced, the harder they are to maintain and troubleshoot. The below is a non-complete/non-exhaustive guide to give an indication of how to sustainably manage a range of populations and Internet access speeds. Within the shared radiospace and wiredspace of any network fabric it is required to prioritise low latency applications and protocols such as those of VoIP, videoconferencing, etc. above those which are deemed non-realtime or non-valid by an organisation. When congestion or contention inevitably arises (as it does in any over-subscribed or free radical systems) latency unfortunately increases and packets may be discarded affecting performance resulting in user experience suffering. No buffer is infinite and all worldly systems have finite reources and throughput which have to be managed. It is with this understanding, especially in a BYOD(Bring Your Own Device) environment, where devices are unmanaged, that the requirement for control and policy enforcement is paramount to avoid a ‘tragedy of the commons’. Traffic engineering is that aspect of internet network engineering dealing with the issue of performance evaluation and performance optimization of operational IP networks. In this case the options are somewhat limited with a single ISP connection however with application visibility available at the access edge or core, a certain amount of traffic manipulation is both recommended and warranted. There are many options generally available within a managed network footprint (depending upon the hardware and software) to mark, mutate, shape, queue, policy route, and otherwise mangle traffic - whereupon different classifications of packets and flows can be treated differently. This can improve the user experience and/or defend and protect assets. This is only achievable with a prerequisite ability to classify and make visible certain characteristics of data flows. It is recommended to confirm the types and classes of CoS(Class of Service) and QoS(Quality of Service) honoured by your ISP as part of their supplied commercial service to help engineer traffic further on its journey. yet the term CoS is normally used to describe the layer 2 CoS bits (of which there are 3). Additionlly, layer 3 packets can carry either the older ToS IP Precedence (IPP) value or in the same location a Differentiated Services Code Point (DSCP) value. DSCP values are backward-compatible with IP Precedence values. So, for a layer 2 broadcast domain (wired and wireless) the CoS bits will remain until a layer 3 boundary whereby the in-path infrastructure device will need to honour/trust the CoS values, map them to layer 3 DSCP values, or re-write the CoS bits back to its configured default. If the DSCP values are marked from the outset by the endpoint or access point, then if the in-path infrastructure trusts these markings (and does not mutate them) they will continue on their journey as far as they can in the layer 3 packet i.e. outside of the local broadcast domain. This is also why it’s important to understand what classes/values your ISP will accept and honour/trust, otherwise the ISP will re-write the values to their chosen ones and special classes of traffic will not be treated the same end-to-end. This end-to-end treatment is important for things like VoIP. It can indeed get quite confusing once wireless is thrown in to the mix however the best raw visual reference this author has found is https://www.netcontractor.pl/blog/?p=371 however it does not contain the WMM(Wireless Multimedia Extensions) AC(Access Categories). The best overview of wireless QoS is here: https://www.revolutionwifi.net/revolutionwifi/2010/07/wireless-qos-part-1-background_7048.html. Albeit WMM/802.11e uses AC(Access Categories) of Voice, Video, Best Effort, and Background, they are sometimes mapped differently to their 802.1p/D counterparts of CoS/PCP(Priority Code Point) values depending upon the vendor in play. A simple 3 way classification rule is recommended by Podomere (excluding the default bucket) for any marking and handling of client side traffic. All classfications should be consistent end-to-end for simplicity and supportability. On the whole most client PDU(Protocol Data Unit) CoS markings should be trusted yet we recommend demoting certain traffic based upon explicit destinations, flows, ports, and layer 7 attributes for fair-share purposes. We recommend shaping and demoting things like Dropbox and Google Drive traffic even within a users own allocated bandwidth to prevent them from hurting themselves and monopolising radio airtime. Some of these protocols espouse automatic back-off and self-policing however in practice this is rarely the case. Also the argument of TCP slow start and sliding windows is not a relevant argument as buffer bloat is real and rather than wait for congestion to happen, we prefer to avoid it and promote a consistent user experience. We recommend using the layer 2 WMM/802.1p values of 0,2,5, and 7 only (where 0 is the traditional and default marking). Note: The following is a subset of a larger table used for pod design purposes only. Then use the matching CS/DSCP values of CS0/DSCP 0,CS2/DSCP16,CS5/DSCP40, and CS7/DSCP56 to mark, queue, and apply policy (with the preference being the DSCP values for marking and mutation). Layer 3 (1 ToS byte): -> DiffServ/DSCP (or ToS/ToS hex match) -> wired fabric -> Endpoint B. For example, Aerohive access points and switches use ‘Classifier Maps’ and ‘Marker Maps’ which allow one to place traffic in to logical classes/containers that the infrastructure then treats separately based upon certain attributes and user policies. As CS7/DSCP56 is reserved for network-control (low loss) data we actually mark low-latency VoIP, RTMP, Video Conferencing, and other low latency classes of traffic with this value and then put them in an EF(Expedited Forwarding) PHB (Per Hop Behaviour) queue (if configurable). EF https://tools.ietf.org/html/rfc3246 is a behaviour class that is deemed low delay, low loss and low jitter. We then use CS5/DSCP40 for video and music streaming and CS2/DSCP16 for all online backup, file sharing, p2p, software updates, and FTP, with CS0/DSCP0 the default for all other traffic. If the core platform chosen does not support explicit marking, mutation, queuing and classification then a more simplistic shaping and queuing methodology of High, Medium, and Low can be used. Note: Your mileage may vary and the below relates to a 20/20 mbps link with ~250 devices. The following list denotes traffic which should be policy routed out the primary link with all remaining non-previously matched traffic routed via the secondary link (or can be placed in the ‘scavenger’ or low priority queue if no secondary link is available). This approach conributes to the primary link satisfying even greater than the concurrent 6:1 fan-in ratio mentioned previously. Please note again that both UDP and TCP are specified to ease configuration entry depending upon the platform used. Each piece of infrastructure will have specific tolerances and resource maximums mostly in relation to throughput and sessions. Generally the more features one switches on that look at flows and packets (or cause logging to disk or CPU interrupts) the overall throughput of the device will decrease. Many vendors publish their optimal values in relation to small packets or simplistic configurations yet in the real world once you enable extra features (especially those that hit the control plane) you will find performance decreasing rapidly. In the wireless world of half-duplex radio, the number most often bandied around is ‘associations’ however this is almost meaningless and nothing more than an aribtrary memory lookup table limit. What truly matters is what the endpoints are doing, the features enabled, the quality of the airspace, airtime usage, and whether the layer 3 boundary is further upstream or actually on the access point device itself (i.e. does the access point provide DHCP, routing, VPN, application visibility, queuing etc.). A UPS with ‘pure’ sine wave power conditioning is crucial for the protection and longevity of ones network equpment investment. Many buildings suffer from over-voltage, power spikes, and interference which leads to damage or undesirable knock on performance issues. Additionally remote management is required for instrumentation and management purposes. Note: Please ensure any data cabinet is earthed and a UPS is never left unplugged without powering down all the equipment in tandem (or ensuring the cabinet is fully earthed). It is highly recommended to source a 12 or 16 RU(Rack Unit) cabinet or greater, complete with either castors or a strenghened wall mount that’s rated for the intended load (as a rack mounted 2RU 1000VAC UPS alone weighs ~ 30kg). If it is not feasible to mount a rack/cabinet to a suitable wall then perhaps a tower based UPS could be used (or castor wheels could be put on the rack/cabinet). It is very important to source a full depth rack/cabinet such that the internal height, width, and depth account for all device requirements. Additionally, the rack/cainet must be lockable, have fan vents, and should be sourced with cable management and rack nuts. If the cabinet is not located in a dedicated secure physical space, extra thought should be given to ensuring the correct protection against unauthorised cable access and/or unauthorised modification of sensitive data such as CCTV footage (via physical access). To ensure investment protection and the proper functioning of equipment the environment must be free from dust and able to be kept cool (and if possible fully air conditioned). All devices have temperature and humidity thresholds and tolerances such that they shutdown, fail or become damaged if thresholds are exceeded. must be fully accounted for and met. Any room or space that is to be used for telecommunications and network equipment should be maintined within required operating conditions and limits. Extraction fans on racks/cabinets are also recommended. Sufficient environmenal air-flow must also be considered otherwise other efforts are invalidated. RU (Rack Unit) numbering is top down for schema however most racks are numbered from the bottom up in ascending order. Every operations department’s utopia is what’s known as a ‘single pane of glass’ where one can view and potentially manage the state of all I.T. and infrastructure related assets from the same screen. This however is rarely achievable and in some cases actually undesirable as the level of abstraction and compression of situational information can lead to a loss in fidelity and actually hamper decision making (via leaky abstractions). On the whole it is desirable to reduce the complexity, configuration time, and management overhead via a smaller and more tightly integrated vendor footrpint. In this case the unified management of Aerohive’s wired and wireless cloud management of an access edge can help to lower operational expenditure and decrease complexity especially when applying consistent policies to devices across a unified infrastructure. To remove the need for local controllers and on-site specialist engineering resources, the access edge should be cloud managed when and where possible. Over and above remote SSH or HTTPS access to devices it is deemed both cost effective and efficient to embrace full remote management of devices (with few exceptions). As long as access edge devices continue to operate and provide their basic data, control, and management control plane services (even when unable to connect to cloud based management services), then cloud management should be embraced to lower the TCO(Total Cost of Ownership). On the other hand it is desirable not to ‘put all ones eggs in one basket’ from an operational risk perspective by creating a single failure domain. Software vulnerabilities, operator error, and cascade failures in common components of codebases can cripple a homogenous platform. It is thus recommended to use diverse heterogeneous vendors/equipment for at least one tier of a pod (at the core, distribution, or access layer). Unified management views of disparate infrastructure are not normally achieved without significant investment in time, resources, and custom integration - thus for example an Aerohive wired and wireless access edge combined with a Fortinet firewall router core (that supports future clustering) is deemed a good example pairing. The availability of commercial vendor support 8x5 business hours (with optional upgrade to 24/7) is paramount as is hardware replacement. Additional coverage for next day on-site replacement is even more desirable if not running a full n+1 clustered and redundant environment. It will also take time to reload the latest configurations to your devices thus impacting your MTTR and Availability metrics. Always ensure you have current backups of all configurations (after every change) and a method to restore them to each device. Remember that backups are almost worthless unless a valid restore can be performed. Without getting in to discussions on Change Management, it’s quite easy (with many devices and vendors) to trigger an automatic off-site backup of the updated config immediately once changed or committed.